This present-day aspect of Kirkgate on the eastern, or beck, side was opened up in the late 1970s following the demolition of an historic row of three properties, Nos. 58-62, which adjoined what is now the iXtek.co.uk computer repair, maintenance and upgrades shop at No. 56. These are the properties that were demolished. Rob's Trading Centre and taxi service were run by Rob Whitlock. This view (May, 1974) of the empty shops prior to demolition also shows the full frontage of No. 56 with the old stone steps up to the first floor. The steps were removed after demolition and the filled-in section can be seen in the present-day picture where the iXtek sign is placed. The shop at that time was Maureen's hair stylist. 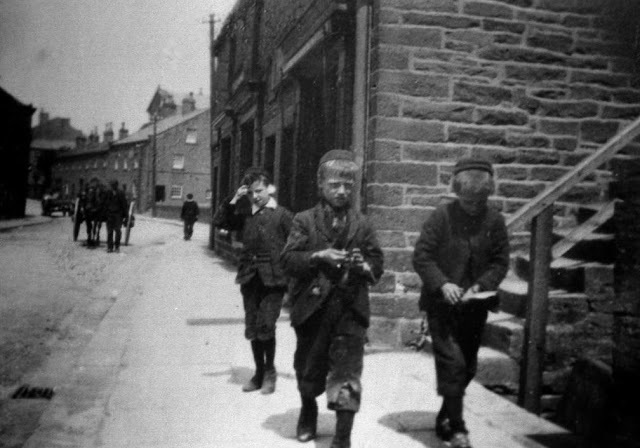 Photograph by courtesy of Silsden Camera Club. 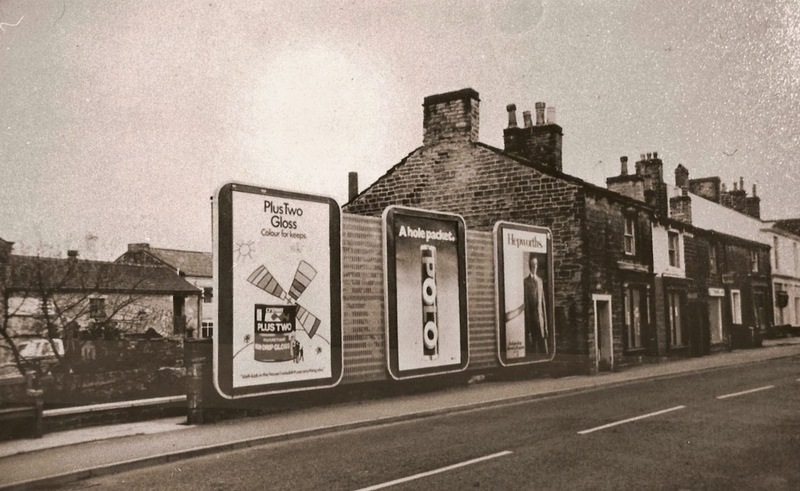 Advertisement hoardings were in place for several years up to the demolition of the adjoining properties. Photo by courtesy of Silsden Camera Club. Nos. 58-62 Kirkgate in the late 1800s. These chaps, apparently amused by the photographer, are sat on the ledge of what ended up as Rob's Trading Centre. But at the time this photograph was taken it was the Wade family's boot and shoe shop, which it had been since at least 1790. John William Wade, who died in 1940, aged 81, had run the shop for many years, as had his father and grandfather before him. At the turn of the century, John William and his brother Richard were two of the UK's foremost poultry exhibitors, particularly White Leghorns and Black Minorcas. 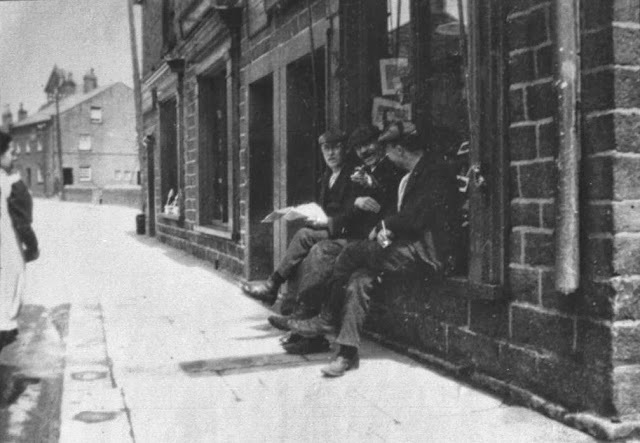 Some years before retiring, Mr Wade's son-in-law, Herbert Cooper, had taken over the business, which eventually became Cooper's shoe shop on the opposite side of Kirkgate where the travel agency is now. Photograph from the late Kevin Bower's collection. Another late Victorian view of this stretch of Kirkgate looking towards the gable end of what is now the Post Office, which opened there in 1907. Note the stone steps of No. 56 just behind the boys. Photograph also from the Kevin Bower collection. No. 62 Kirkgate, which had been an ironmonger's since at least the 1870s, in the hands of Thomas Langhorne, a tin-plate worker born in 1844, and his wife Sarah. They are pictured here. Thomas died in 1900, after which the shop continued to be run for a few more years by Sarah, assisted by her son John Asquith Langhorne. Thomas was the grandfather of five well-known Silsdeners still within living memory: Eva, Sally, Lucy, Edith (Murgatroyd) and Thomas, a noted local singer.